Cutting onions is a dreaded cooking chore for most people. Your eyes sting and water. How many times has the onion slid around on the cutting board because you couldn’t get a good grip on it, or you ended up with totally uneven rings? The only worse thing is accidentally cutting yourself with the knife. Here is the newest invention – the onion slicer. It enabled you with an easiest way to cut onions and other vegetables (like zucchini, tomato etc) with hardly any effort in no time. No more funny shaped slices, or slipped fingers, just nice and even cuts. 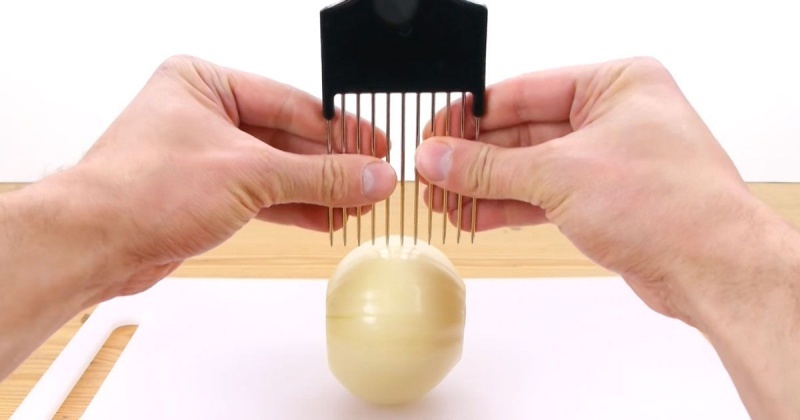 This life hack, which doesn’t require anything more than a hair pick ensures you get perfectly diced and sliced vegetables every time. Check out Clever YouTuber DaveHax’s video showing how he uses a hair tool to perfectly slice and dice onion, as well as chop other vegetables. So for those who love to cook despite it not being your forte, this life hack will at least make the prep work a little less frustrating.